Three Weeks in December is a story of strangers, primarily from an American perspective, in a strange land, south-eastern Africa. The story is told in the alternating perspectives of Jeremy in the late 19th century and Max in the late 20th century in present day Rwanda. Both Jeremy and Max are outsiders in the true sense of the word and both are launched on a course of self-discovery. Jeremy is apparently the only American working for the British in the construction of a railroad and he knows little of the customs, languages or habits of the indigenous population or the hired workers. Jeremy was also considered an outsider in his family back in Maine because of his sexual orientation (to be a single, relatively healthy man with no apparent inclination toward women was highly suspect). As a result Jeremy felt it best to leave his family and home. He intends to become a white settler in British East African after he completes his engineering tasks. However, this task is imperiled by two rogue lions that have boldly attacked men in the work camp. As the boss in the camp, Jeremy must hunt these lions and protect his workers. Over the course of several weeks, Jeremy launches his nightly vigils in an effort to kill the lions. His only companion is his African guide, Otombe. As Jeremy and Otombe sit and await the lions, Jeremy finds himself drawn to Otombe, an attraction he knows he can never act upon. Max Tombay is a postdoctoral ethnobotanist. She knows that jobs will be difficult to come by, especially with her Asperger's Syndrome. But a great opportunity is literally handed to her when she is asked by a pharmaceutical company to travel to Rwanda and locate a vine that could become a lifesaving drug. Max knows that her Asperger's and single-minded focus is as asset in this area so she accepts. Max's mother isn't very happy with her daughter traveling to a war-torn region, but she can't stop her. In short order Max travels to Rwanda with an ample supply of grey clothes, oatmeal and tofu. Just as Jeremy had difficulty assimilating to British East Africa, so does Max, but she is determined to make it work. She learns through trial and error and grudgingly gets along with the other researchers in the mountain-based research station. What Max finds amazing is that she gets along and understands the apes much better than she does her fellow researchers. Unfortunately all is not what it seems in Rwanda and Max and her fellow researchers must deal with the high possibility of an attack by rogue rebels. All of the action presented in both Max and Jeremy's stories cover the same three weeks in December, albeit separated by 100 years. It isn't clear how their stories are linked until the very end. Ms. Schulman has provided two stories that could have stood alone but together seem to mirror one another in the difficulties both Max and Jeremy are facing. The historical information provided is quite detailed enough to provide a realistic starting point for both stories. The graphic details of the African landscape are such that it is almost possible to close your eyes and visualize the scene. The description of the apes is also quite realistic and they become additional characters in Max's story. I found myself rooting for Max and Jeremy, as well as the apes, in their struggles to survive. 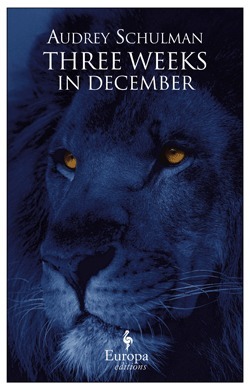 Three Weeks in December is an emotional read that provides for a little suspense and adventure. This is a beautifully written story that drew me in from the very beginning and held my attention to the very end.